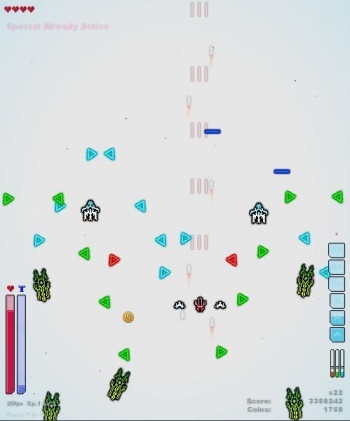 There came a point during Frantic 2 when I realized that it was becoming increasingly hard to tell the enemy ships apart from their bullets, and to tell the bullets apart from the powerups that they were dropping, and to tell the powerups apart in and of themselves. Of course, I didn't have time to reflect on that because I had to continue dodging the bullets, but it was an interesting thing to note. Frantic 2 is a shoot-em-up that ... let me put it this way: While it doesn't quite fall into the "Bullet Hell" mold, it's a good thing that the game handles the actual shooting for you, since you've got other things to concentrate on. Waves of enemies fill the screen, shooting colorful bullets at you in intricate patterns that you have to dodge - but not too closely! Grazing enemy bullets fills your Adrenaline gauge, letting you unleash a superpower like slowing down time, putting up a magical shield, or unleashing a massive laser of death. The game is certainly "Frantic" even on its easiest difficulty; I don't even want to think about what'll happen when I start cranking it up a notch. But there's no better way to get your blood pumping than a fast-paced curtain-of-death shooter with a rockin' guitar soundtrack. Happy weekend, people.